(MoneyWatch) Americans are likely to get smacked by an unwelcome blast from the past -- run-away inflation -- in the not-too-distant future thanks to economic policies that are aimed at helping the economy today, says Steven Cunningham, director of research and education at the American Institute for Economic Research (AIER), a non-partisan economic think tank. 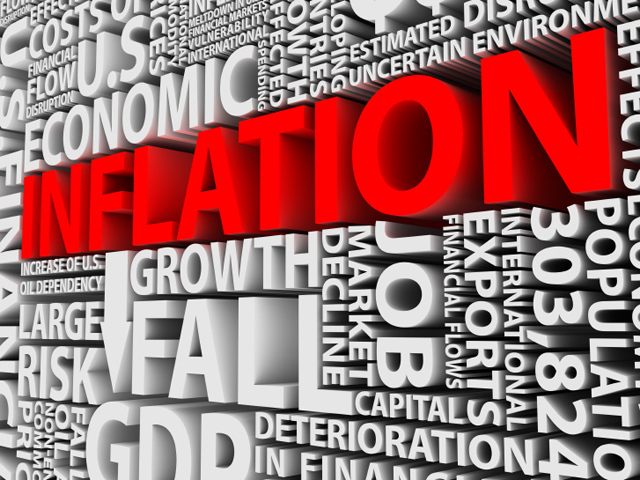 While this inflation won't strike overnight -- it's likely at least a year away -- some economists believe it will be double-digit and uncontrollable when it does hit. "We may not see any real inflation for two years - or even three or four. But when it comes, it's going to come fast and rampant," agrees Lance Roberts, chief economist for StreetTalk Advisors in Houston. The reason: To boost today's lackluster economy and encourage companies to hire, the Federal Reserve has been pumping money into the economic system, which is building up in bank reserves. Banks are still reluctant to lend, so that money is not yet being lent out and spent at historically normal rates. But eventually it will be. At that point, it's likely to boost American buying power by about 40% from today's levels, which is a precursor to run-away inflation. The Federal Reserve is not blind to the risk, of course. The agency has already come up with a host of unconventional ways to try to drain money out of the banking system to stem inflation. But AIER estimates that, at best, the agency will be able to drain about 25% of these reserves from the system. Using that scenario, the non-partisan economic research organization estimates future inflation at 15%. Roberts doesn't attempt to predict a rate, but calls the Fed's notion that it can head-off inflation "far fetched." The good news is that inflation is still far enough away that this expectation is not yet baked into market prices for either stocks or bonds. That means you have time to take steps now that will put you in a position to reduce your personal inflation rate and potentially profit from the rising interest rates that inflation brings. What should you do? Borrow long: About one-third of the typical family budget is dedicated to keeping a roof over your head. That means you can reduce your personal inflation rate by one-third by locking in a 30-year fixed-rate mortgage. With good credit, conforming loans (those under $417,000) currently cost between 3.5% and 4% annually. That translates to monthly payments of just over $450 per $100,000 borrowed. Never borrow more than you can pay back, of course. But stretch out any loan this cheap for as long as you can. Slash variables: If you have a home equity loan that "floats" above prime rate, pay it off. Also pay off credit card debts and any other variable-interest loans that you can. If and when inflation rises, so will interest rates, making borrowing far more costly in the future. In 1980, for example, prime rate - the rate banks charge their best customers - hit a high of 21.5%. You do not want to get caught with a variable-rate loan that costs more every month, making it increasingly difficult to pay off. Build reserves: If you need to finance a business, buy a house or a car in an inflationary environment, you can be in a world of hurt. The best way to mitigate that risk is to build cash reserves now so you'll improve your ability to pay cash, if necessary, later. Cash reserves are also likely to yield more in an inflationary world, so if you don't end up needing the money for purchases, you're likely to be able to invest it in relatively safe securities at historically high rates of return. Buy commodities & REITS: Holding a portion of your investments in commodities, like oil and agriculture products, and Real Estate Investment Trusts that generate much of their income from rents that are likely to rise with inflation, can help your investment portfolio keep pace with the rate of inflation. Of course, commodities and REITs should only make up a small portion of your portfolio -- somewhere between 5% and 20% of your long-term assets. And, ideally, you want these assets to be widely diversified, so its best to invest through mutual funds and exchange traded funds, such as Vanguard's REIT ETF or Power Shares Commodity Index ETF. Invest in well-capitalized companies: While inflation can make it harder to finance business, a number of companies have been paying off their debts and building up huge hordes of cash reserves -- the same smart strategy that can work for you. Apple, for example, has roughly $100 billion in cash; Microsoft is sitting on a stockpile worth more than $50 billion. Assuming that these companies produce unique products that people will pay for, even when prices rise, they should prove to be great investments for the coming decades. Go green: One of the areas where inflation hits the hardest is at the grocery store, where the cost of everything from meat to vegetables is likely to rise. If you've got a backyard, think about defraying your grocery expenses with a garden. One fruit tree can keep you in oranges or plums all season and provide the makings for preserves for the rest of the year. Squashes, and root crops, like potatoes and carrots, are also easy to grow and many reseed themselves when you compost.